Robin Flint from the Hull Nantasket Chamber of Commerce is a guest during this segment of Monday Night Talk! 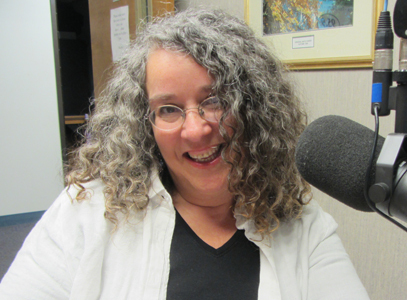 Robin shares details of Hull's third annual Stem to Stern – Town-Wide Yard Sale Day on Saturday May 30. The event lets bargain hunters visit dozens of yard sales all over town while exploring neighborhoods off the beaten path and discover there’s more to Hull than just Nantasket Beach! Do you have an topic for a future show or info on an upcoming community event? Email us at mondaynighttalk@gmail.com or "like" and post a comment on our Facebook page: www.facebook.com/mondaynighttalkon959fmwatd. If you're a fan of the show and enjoy our segments, you can either download your favorite segment from this site or subscribe to our podcasts through iTunes today! © Monday Night Talk with Kevin Tocci - 2015. Unauthorized use and/or duplication of this material without express and written permission from the show host and/or owner is strictly prohibited. 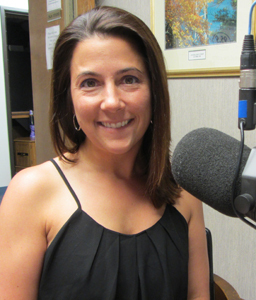 Hilary Lovell, the ‎Health Marketing Coordinator at Signature Healthcare Brockton Hospital is a special guest during this episode of Monday Night Talk! Hilary share details about a free community health day: Signature Healthcare’s Health and Wellness Expo at the Shaw’s Center, Saturday June 6 from 9:00 to 1:00. Health screenings will be available, including blood pressure, cholesterol, vascular, and glucose screenings. Visitors to the expo can watch healthy cooking demonstrations, visit “ask the clinician” stations, bring the kids for fun activities and enter the free raffle for a mountain bike! Signature Healthcare’s Health and Wellness Expo is open to the public with free admission and parking! Stop by Saturday June 6 at the Shaw’s Center, located at 1 Feinberg Way, Brockton. For more information visit www.MySignatureCare.org or call us at 508-941-7654. Do you have an topic for a future show or info on an upcoming community event? Email us at mondaynighttalk@gmail.com or "like" and post a comment on our Facebook page: www.facebook.com/mondaynighttalkon959fmwatd. If you're a fan of the show and enjoy our segments, you can either download your favorite segment from this site or subscribe to our podcasts through iTunes today! © Monday Night Talk with Kevin Tocci - 2015. Unauthorized use and/or duplication of this material without express and written permission from the show host and/or owner is strictly prohibited. 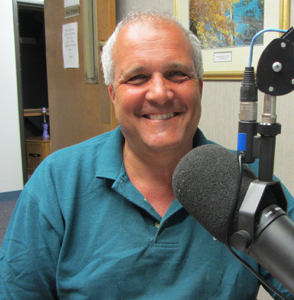 Plymouth County Commissioner Chairman Dan Pallotta is a guest during this segment of Monday Night Talk! 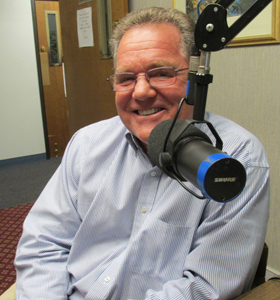 Dan discusses some the challenges the county is facing with the Fiscal 2016 budget. Do you have an topic for a future show or info on an upcoming community event? Email us at mondaynighttalk@gmail.com or "like" and post a comment on our Facebook page: www.facebook.com/mondaynighttalkon959fmwatd. If you're a fan of the show and enjoy our segments, you can either download your favorite segment from this site or subscribe to our podcasts through iTunes today! © Monday Night Talk with Kevin Tocci - 2015. Unauthorized use and/or duplication of this material without express and written permission from the show host and/or owner is strictly prohibited. Rob Hakala and Lisa Azizian from WATD's South Shore Morning News radio show are guests on this episode of Monday Night Talk! 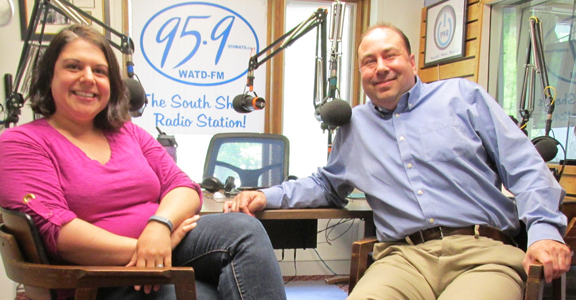 From May-August, Rob & Lisa of The South Shore’s Morning News on 95.9 WATD will broadcast LIVE from different towns around the South Shore! They'll interview a mix of business owners and notable residents about what makes their community unique.The first trip is set for Friday, May 29 from 6 - 10am, as they travel to Sylvester Field in Hanover. For a list of locations they will visit, visit 959watd.com/morningtour/. Do you have an topic for a future show or info on an upcoming community event? Email us at mondaynighttalk@gmail.com or "like" and post a comment on our Facebook page: www.facebook.com/mondaynighttalkon959fmwatd. If you're a fan of the show and enjoy our segments, you can either download your favorite segment from this site or subscribe to our podcasts through iTunes today! © Monday Night Talk with Kevin Tocci - 2015. Unauthorized use and/or duplication of this material without express and written permission from the show host and/or owner is strictly prohibited. State Representative Jim Cantwell is a guest on this segment of Monday Night Talk! Rep Cantwell and Joe Rossi, chairman of the Marshfield Citizen Coastal Coalition discuss the latest info on flood insurance rates, as Joe shares details of a week-long conference that was held in the Washington DC. Do you have an topic for a future show or info on an upcoming community event? Email us at mondaynighttalk@gmail.com or "like" and post a comment on our Facebook page: www.facebook.com/mondaynighttalkon959fmwatd. If you're a fan of the show and enjoy our segments, you can either download your favorite segment from this site or subscribe to our podcasts through iTunes today! © Monday Night Talk with Kevin Tocci - 2015. Unauthorized use and/or duplication of this material without express and written permission from the show host and/or owner is strictly prohibited. 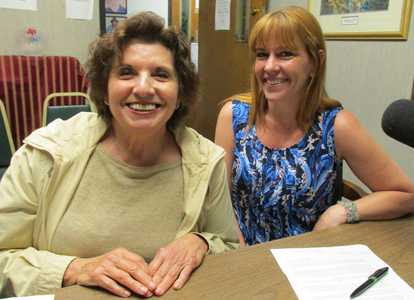 Tammy Murray, Director of Elder Affairs for the Kingston Senior Center and Marilyn Greenstein are guests during this segment of Monday Night Talk! Tammy (pictured below on right) and Marilyn not only share the many services, programs and events that the center provides, but also to dispel the myth that the facility is only for senior citizens. Anyone looking for more information about the Kingston Senior Center can contact Tammy at 781-585-0511. Do you have an topic for a future show or info on an upcoming community event? Email us at mondaynighttalk@gmail.com or "like" and post a comment on our Facebook page: www.facebook.com/mondaynighttalkon959fmwatd. If you're a fan of the show and enjoy our segments, you can either download your favorite segment from this site or subscribe to our podcasts through iTunes today! © Monday Night Talk with Kevin Tocci - 2015. Unauthorized use and/or duplication of this material without express and written permission from the show host and/or owner is strictly prohibited. 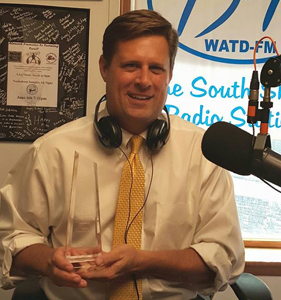 State Representative Geoff Diehl is a guest on this segment of Monday Night Talk! Rep Diehl calls into the show to give an update on the Rt 3 Toll Road, the widening of Rt 18, the MBTA and the 2024 Boston Olympics! For more info or to share and issue with Rep Diehl, email him at www.geoffdiehl.com. Do you have an topic for a future show or info on an upcoming community event? Email us at mondaynighttalk@gmail.com or "like" and post a comment on our Facebook page: www.facebook.com/mondaynighttalkon959fmwatd. If you're a fan of the show and enjoy our segments, you can either download your favorite segment from this site or subscribe to our podcasts through iTunes today! © Monday Night Talk with Kevin Tocci - 2015. Unauthorized use and/or duplication of this material without express and written permission from the show host and/or owner is strictly prohibited. State Senator Bob Hedlund is a guest on this episode of Monday Night Talk! 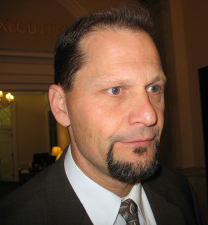 Senator Hedlund calls in to talk about his decision to run for mayor in Weymouth, what some of the issues in the race will be, plus the upcoming discussion at the State House regard the MBTA and the FY2106 budget. Do you have an topic for a future show or info on an upcoming community event? Email us at mondaynighttalk@gmail.com or "like" and post a comment on our Facebook page: www.facebook.com/mondaynighttalkon959fmwatd. If you're a fan of the show and enjoy our segments, you can either download your favorite segment from this site or subscribe to our podcasts through iTunes today! © Monday Night Talk with Kevin Tocci - 2015. Unauthorized use and/or duplication of this material without express and written permission from the show host and/or owner is strictly prohibited. 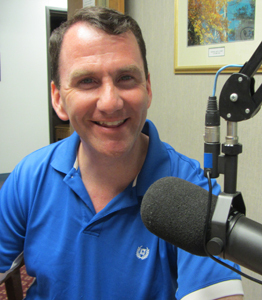 State Representative Tom Calter was a guest on this segment of Monday Night Talk! Rep Calter discusses two upcoming drug forums, one is being held on Wednesday, May 20 at Silver Lake Regional High School for grades 9 and 11, while the other is on Thursday, May 21 at the Duxbury Free Library, which is geared toward parents. Do you have an topic for a future show or info on an upcoming community event? Email us at mondaynighttalk@gmail.com or "like" and post a comment on our Facebook page: www.facebook.com/mondaynighttalkon959fmwatd. If you're a fan of the show and enjoy our segments, you can either download your favorite segment from this site or subscribe to our podcasts through iTunes today! © Monday Night Talk with Kevin Tocci - 2015. Unauthorized use and/or duplication of this material without express and written permission from the show host and/or owner is strictly prohibited. 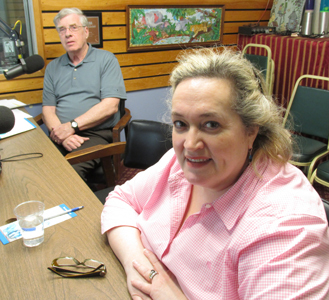 TIC Network Executive Director Bob Daly and board member Christine James are guests for this segment of Monday Night Talk! Bob and Christine discuss the importance and what the Talk Information Center offers as a service to the visually impaired around the state of Massachusetts. They also talked about funding issues the organization almost had to endure. Do you have an topic for a future show or info on an upcoming community event? Email us at mondaynighttalk@gmail.com or "like" and post a comment on our Facebook page: www.facebook.com/mondaynighttalkon959fmwatd. If you're a fan of the show and enjoy our segments, you can either download your favorite segment from this site or subscribe to our podcasts through iTunes today! © Monday Night Talk with Kevin Tocci - 2015. Unauthorized use and/or duplication of this material without express and written permission from the show host and/or owner is strictly prohibited.